Article first published as Laurent Gbagbo Surrenders – Victory for African Masses on Technorati. The embattled Ivorian president Laurent Gbagbo has finally surrendered power to the acclaimed winner of last year’s presidential elections Mr Alasane Ouattara. According to Radio New Zealand, the erstwhile president is already trying to negotiate with the UN to guarantee his protection. Forces loyal to Alasane Ouattara have already taken over the key positions in the national capital Abidjan, including the president’s residence. The incumbent is now negotiating for a deal because his defense has now been overwhelmed. 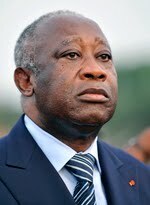 The UN, AU and ECOWAS have all been calling on Gbagbo to cede power since it was clear he lost the election but all pleas fell on deaf ears. He is now considering that option when a lot of innocent souls have been sent to their early graves. This still brings to question the kind of leadership Africans have had to grapple with for centuries. No one wants to accept defeat and no one wants to peacefully vacate his position. Some even see the seat of governance as their birthright and so would do anything humanly possible to cling to the reins of power. Surprisingly, all through this period of political upheaval in Cote D’ivoire, ECOWAS and The African Union watched helplessly and failed to do anything tangible to curb the rate of violence and bloodshed that erupted after the elections. They kept buying to negotiate Gbagbo’s exit. Even when at a time it seemed that Laurent Gbagbo’s loyalists would override the opposition, the ECOMOG troop stationed in the country waited endlessly to receive order from the powers that be in order to use military force to flush out the incumbent who refused to be a good loser. It however took the intervention of the French troops to box Gbagbo into surrender. When would these regional powers learn to handle situations or intervene at the nick of time to avert the killing of unarmed innocent civilians? The triumph of Outtara’s men over Lauraent Gbagbo and his loyalists is victory for the masses in Africa and indeed victory for democracy. It should send a warning signal to other leaders that there would always be people who are ready to defend democracy with the last drop of their blood. Gbagbo has now understood that those who live in a glass house should not be the first to cast a stone. He started by carrying arms: he should understand that “he who lives by the sword dies by the sword”. Now that he has wasted so many innocent lives, he should not be thinking of how to preserve his. Those lives he wasted were as important as his.